Kevin Wyatt of Byrnes talks about coaching, running in high school and his perspective on several topics. When and how did you get involved in coaching? I got involved in coaching right out of college except it wasn't cross country at first, I coach basketball as well and have been coaching basketball at Byrnes since 2007. I have always been intrigued by the way cross country runners approach handling their business, they typically are the smartest, and hardest workers so I clearly gravitate to those types of individuals. I believe since I have a running background, it has been a perfect fit. How do you see yourself in coaching how you have adjusted and changed? I have really tried to develop our harriers into the most well rounded person they can be, each season is so different, when I started coaching cross country I had Malik Epps on the roster and my job was easy. You can never really replace Malik Epps so you have to try to develop the next one. Our program caters to 7-12 graders and as we all know, those are huge developmental differences. I have had to be extremely creative. We try different approaches and I fail, then I try again. What challenges have you encountered as a coach? I have struggled with what is the right mix, each program is so different, some coaches do high mileage, some do low mileage, I have tried to keep the main thing, the main thing. I have a unique opportunity to help students have the best of everything. This is many different things, and not just training. I try to help kids seek greatness in school and faith as well. But I will tell you a secret, believing in God is the most important, therefore my challenge is to let God be seen through me. What is your coaching philosophy? Please explain. My philosophy is simple, and can be summed up in one phrase "Be the Gold Standard." That means being Gold Standard in every single aspect of life. Athletically, academically, and spiritually. Our athletes need to know that all their dreams can come true in our program. We want our kids from D5 youth, all the way through 12th grade that it can be done at Byrnes. What have you seen change in the sport? Every team in cross country in South Carolina is SO good. Across the board we are strong, just qualifying for the state meet is so difficult. We want to get where Eric (Cummings) has gotten at Riverside, we want to get where Jeremy (Darby) has gotten at Landrum, and Jeff (Buys) at Dorman. We want to get to the level they are at. You can't just dream it up you have to work tirelessly, year round. What do you think needs to happen in the sport, and why? Man this is a good question...I would like to see qualifying standards in cross country and track. I also think indoor track and field would benefit the state, and make the sport so much better. Relationships. That to me is the biggest, I love when former runners come back and visit our current group, I love it when they tell people what they have done, or accomplished. Just the other day Tori Davies and Conner Kinzie came back to visit, those kids are the foundation of where we are, and where we are going. The longer I coach the more I hope this trend will continue. I want them to know this is their program, our program. We are servant leaders, we serve them, they don't serve us. I enjoy recommending our kids to college, or scholarship programs. This is what I enjoy most. I enjoy watching our youth at meets and seeing them PR. It keeps me young. What is your motivation as a coach? I am motivated with my kids being successful. I have an unquenchable thirst to be the best program in the state. I desire that our kids are get better in all aspects of life. I am motivated to help them, I have to stay on my toes, these kids are smart. How many hours per week do you spend coaching? A LOT! I can't even put a number on it, but I don't feel like it is enough, I love our kids, and our staff, each minute I spend with them is valuable, and you can't put a price tag on it. What do you enjoy to do as hobbies when not at meets, practice, etc.? I love music, I love my family, and I love God so I typically spend time doing these things. I work in church, and the community. I read, and spin many Pearl Jam albums (let those records play). Tell us about your running background and most memorable moments as a runner? 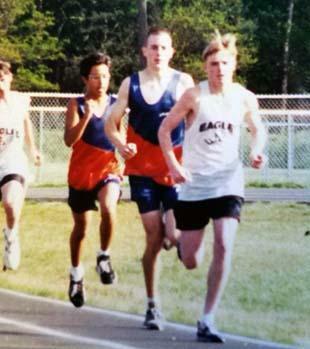 I started running track and field in middle school and I was terrible, I chased all the local legends and one day the light bulb went off and I took it seriously. Running became my escape, it was a mind altering event. When I started running I had to play my Pearl Jam songs on a Diskman because iTunes had not been invented. We didn't have cross country at first and I played football (I was most definitely the worst football player in Chesnee history) My memorable moments are winning the inaugural Appalachian 2-A region championship as a team, I was blessed to win the individual title that year too but the team title was the greatest thing ever. Man I loved running with those guys. We never lost the region while I was in high school. 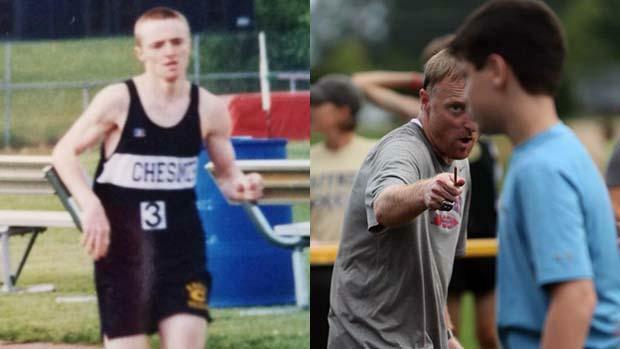 What was high school running like when you attended Chesnee? Running at Chesnee was great. I had the best coach, and teammates around. The entire school supported me. It was so awesome. What do you remember most from being part of the Chesnee teams? I remember the guys. We worked so hard mile after mile. Best group of guys ever. 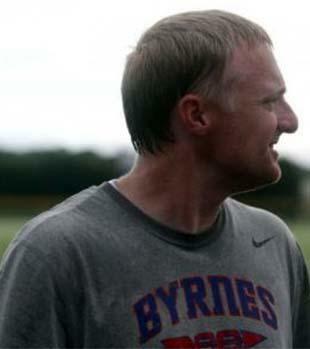 What do you hope to see Byrnes achieve this year and the future? I want to get faster each meet, but I hope we qualify for the state as a team. Not many of our current runners were around the last time we qualified. How do you look at success of runners? What do you hope runners get out of the sport? Running can take you to great places. Running can also provide you with a lifetime of benefits and enjoyment, it really makes you feel good about yourself. Favorite food: Grass fed cheeseburger and corndogs. Favorite cross country course: Sandhills because it means we made it to state. Hobbies: music, traveling, modeling (oops just kidding) reading, and cars, I love cars! Interesting fact: I LOVE PEARL JAM. I have been to tons of shows, I go see them each tour, and in fact I went to see them in Mexico City last year! I can't help myself.